Analyze and clean junk from your hard drive and speed up PC performance. Our powerful Disk Cleaner is one of My Faster PC's best features. The Disk Cleaner cleans your hard drive, frees up disk space, and speeds up system performance. First Disk Cleaner will scan temp files, browser cache, deleted items, cookies, and dozens of other areas to find files that can be deleted. Applications can run faster free from cache or temp files that can bog them down. The system can run better without unwanted temporary items and more space for fresh paging files. The hard drive can perform better with additional free space and breathing room. We recommend running the Disk Cleaner about once a month for optimal performance, but you can run it even more frequently if needed. Our Disk Cleaner also has advanced features like Flash Cookie cleaning and Flash Cookie management (to save Flash Cookies for banks and trusted websites). 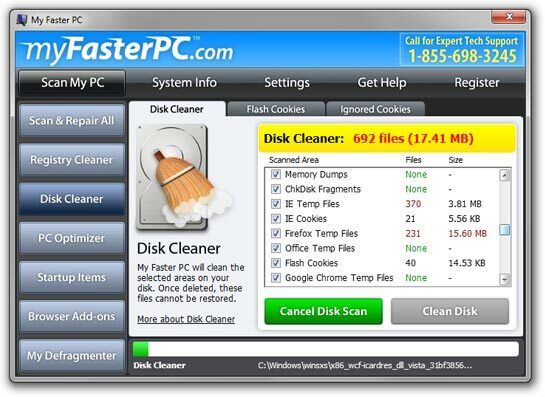 Keep your PC running fast by using the Disk Cleaner tool today. Windows Temp Files: Temporary files stored by Windows. Current User Temp Files: Temporary files stored by programs for the current user. Recycle Bin: Disk cleanup will delete any files you placed in the Recycle Bin. Recent Documents: List of recently accessed documents in the Start Menu. Memory Dumps: A storage area for memory dumps saved during system errors. ChkDisk Fragments: Lost file fragments found during disk error checking. IE Temp Files: A storage area for web pages, images, and temp files for Internet Explorer. IE Cookies: Cookies created by Internet Explorer. Firefox Temp Files: A storage area for web pages, images, cookies, and temp files for Mozilla Firefox. Office Temp Files: A storage area for temp files for Microsoft Office. Flash Cookies: Cookies created by Adobe Flash. Google Chrome Temp Files: A storage area for web pages, images, cookies, and temp files for Google Chrome. Java Cache: Cached and temp files for Java programs. Google Earth Cache: Cached and temp files for Google Earth. iPhone/iPod Firmware: Temp files saved when update Apple firmware. Apple App Installer Cache: Temp files saved by Apple installers. Safari Cache: A storage area for web pages, images, cookies, and temp files for Apple's Safari. iTunes Music Temp Files: Temp files saved by iTunes. SilverLight Temp Files: Temp files and cookies created by Microsoft SilverLight. Broken Shortcuts: Repairs any broken shortcuts. Misc Temp Files: A storage area for additional misc temp files.